Knife Sharpening Using Traditional Methods: Let's start something fresh. 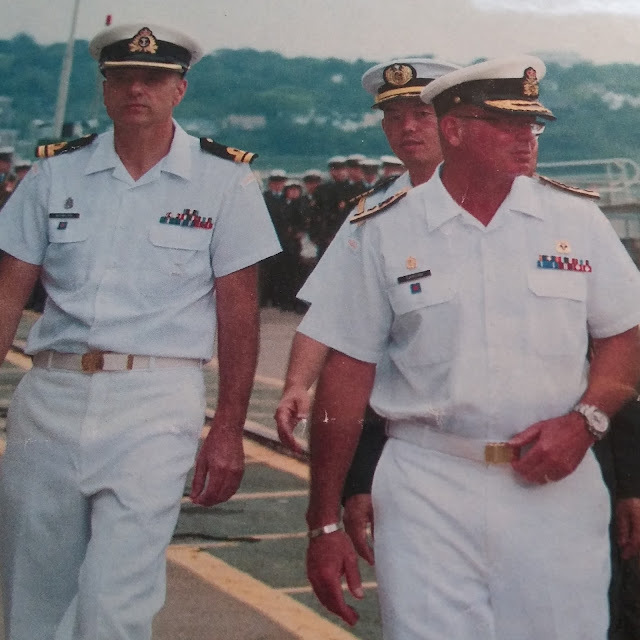 Me on left about to embark on the Japanese ship KASHIMA with my Admiral and a Japanese officer from their Embassy. 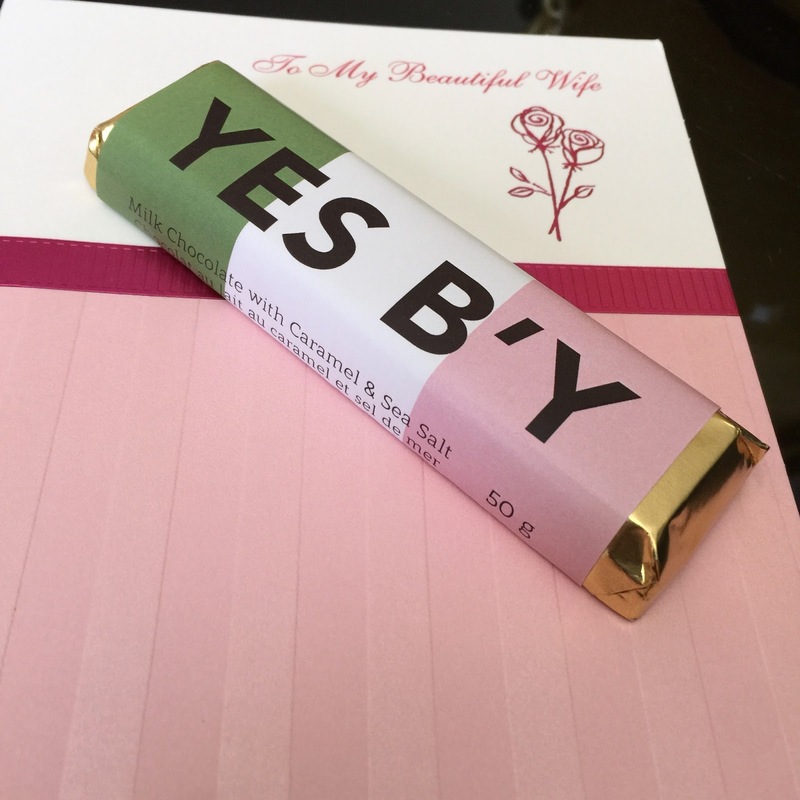 It dawned on me recently that although I love writing on my Blog, I never really planned it out, it has always consisted of articles that just popped up in my head, which I suppose is a good way to do it. However, I get several nice emails or comments on IG from folks who say they follow my Blog and that inspires me. So if people are actually coming here hoping to learn something, it is incumbent upon me to teach them (you), in a methodical manner, not just haphazard stuff. What if I were to create a series of articles that have a flow, a beginning a middle and and end and all sharpening related of course, getting started, then in the groove and finally some advanced aspects of the process. The purpose would be, for anyone interested, how to get started, very very basics and up to the patting yourself on the back level which you can do in the first section as well. I would also like to accompany each article with a video which makes sense. I need to emphasize that this is just how Peter Nowlan, (me) sharpens knives, I completely understand that you may have several sharpening blogs that you visit and other sharpeners and that is cool, I'm just doing my part, if you learn just one thing from me, than I'm not wasting my time. First and foremost, keep it simple. You will see, with today's easy access to You Tube etc, a vast number of experts telling us how to sharpen a knife. That's fine, that doesn't bother me at all. What does bother me are folks who try to sell us stuff that we don't need and also everyone now seems to have a video of themselves performing some type of slicing miracle on a tomato. Now I don't think any of that is bad, it isn't, it's just people making a living and other people showing what they can do, they're proud of it. What I don't like is that a lot of folks, novices for sure can get overwhelmed and confused and think that they need everything they see and hear about and also, unless they can slice the top off a tomato without holding the tomato, they may as well go back to the drawing board. 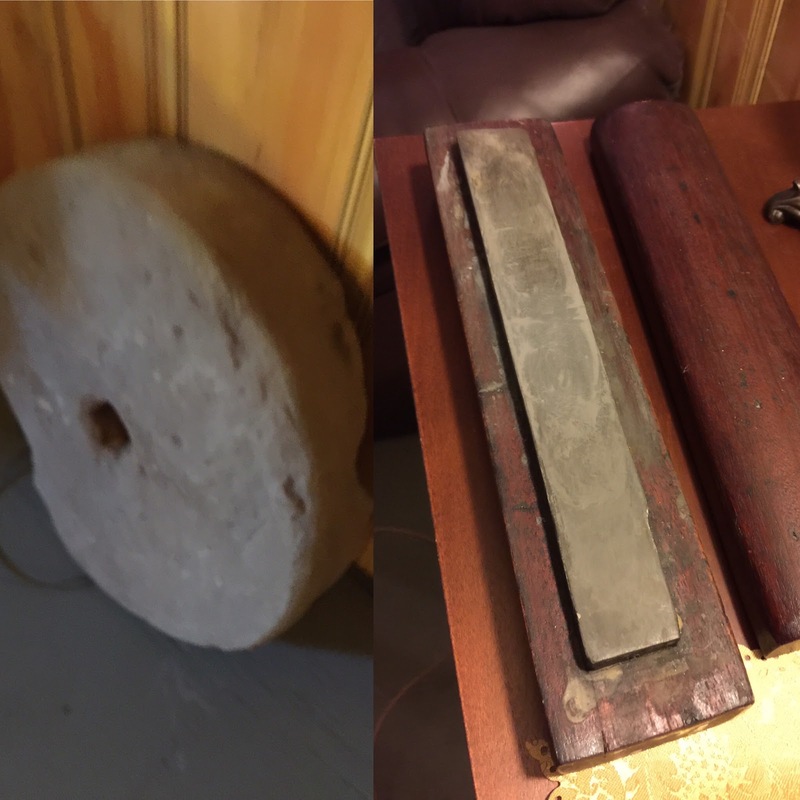 Our Forefathers, our Fathers and Grandfathers sharpening knives on stones like the ones in the picture above. I saw my father do this and I was absolutely amazed at how sharp his chisel became. So if they could use this old and kinda ugly stones, these simple whetstones than we can certainly get started with some very basic items. Nothing stopping you from going out and getting everything you want of course but if you are hesitant and wondering if you NEED more than you think you do, you don't. You need some basic items with which, with Passion, Practise, Patience and Persistence, you can get your knives sharper than new and well beyond that. PASSION: You don't need a lot, you don't need to be obsessed like me, I have the sharpening sickness, you don't need to be there but you do need to want to learn for sure. If you sharpen a knife just because it has to get sharp for your job but there is no feeling attached to the process than that's okay, you're a casual sharpener. It's like me mowing the lawn, I don't have any attachment to the lawnmower, I just want the grass to be shorter but I still do a good job, it's just not something that I think about until I am doing it. A good sharpener and that is what you want to be, will develop an emotional attachment to the water stones and the knives and will be drawn to the unlimited source of satisfaction and reward that is attached to the art of sharpening knives. 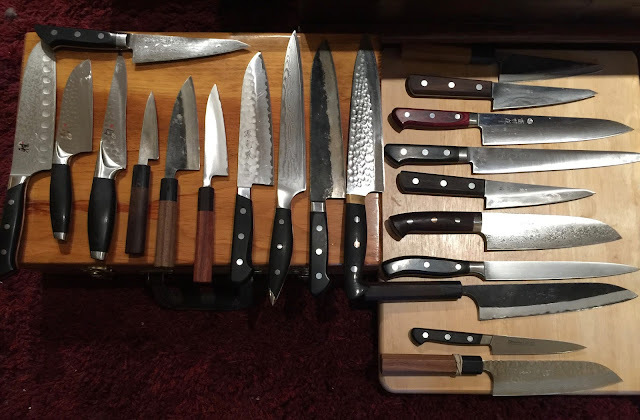 The sensation which is available after just one successful knife sharpening session is like a gift that you give yourself and that gift motivates you and fills you with pride and a sense of worth. You are making dull knives sharp, you and others need sharp knives, you are doing something that others cant. This emotional feedback grows and with that, another layer of passion develops and just as importantly, another layer of confidence. Your Sharpening Journey has begun, it is exciting. 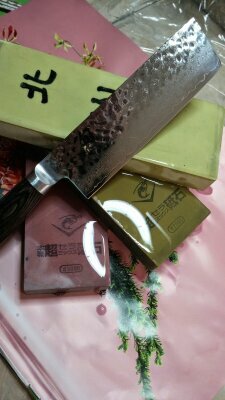 The synergy developed by your desire to improve and the sensation of sharpening a knife on a water stone soon grows in importance. There is no limit here folks, it is like a waterfall, you can just draw whatever amount of water you want for as long as you want. This is how good sharpeners become great sharpeners and with some expectation management and the four P's (Passion, Practise, Patience and Persistence) your journey will be as fulfilling as mine and you'll learn that it isn't a race, the standards to reach are yours to set, if your happy with your work then you're moving forward on your journey. 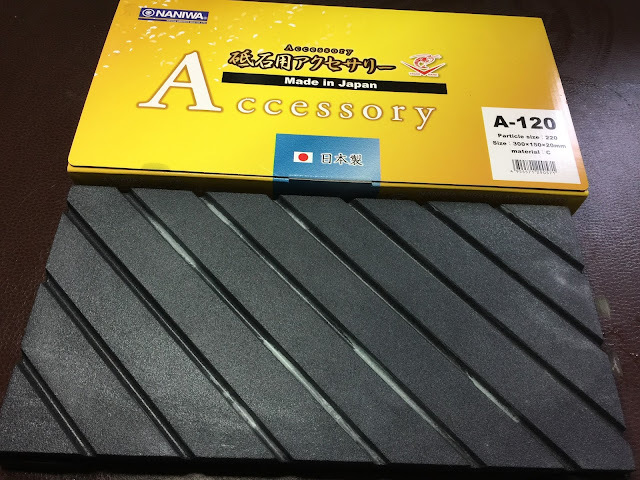 Naniwa 220 grit stone flattener. Obviously I am freehand sharpener so this is all geared towards using Japanese Water Stones to sharpen. If you use an oil stone than this applies too of course, I don't use them so just be aware of that please. You need something to contain the water, the sharpie and definitely a means to keep the stones flat and I will do a video on all of this. You need some good micro fibre towels as well. The the other thing I forgot to put in the picture is a LOUPE, a small, handheld magnifier with an LED light. Mine is 15X and was less than $20.00. It is great for having a very close look at your edges and to gain an appreciation of the different scratch patterns that different grits create on the bevels of the knives being sharpened. More importantly, it allows you to see your mistakes, if you are not reaching the edge of the edge as you sharpen, this will be a visual clue to that and therefore you can correct that. 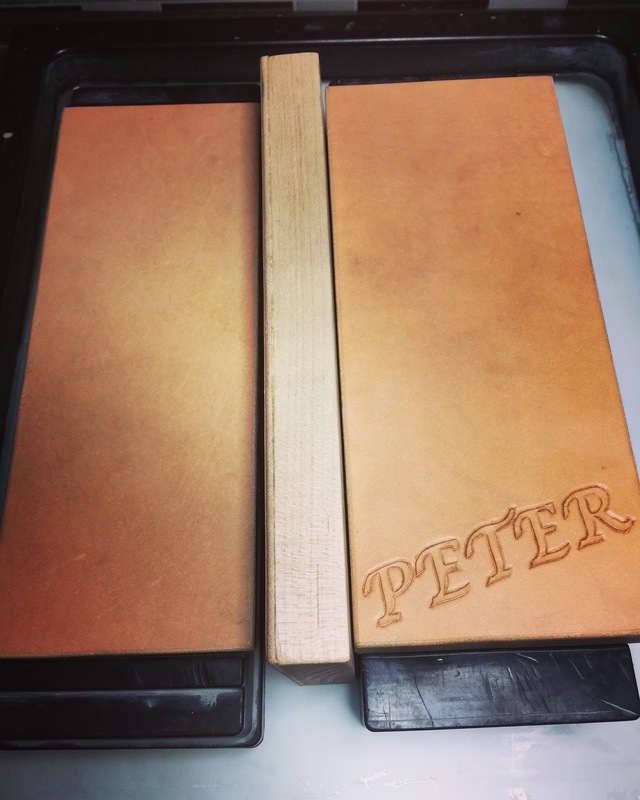 A leather strop is something that I DO recommend but you can wait for a bit to get one because you need to know how to use one and why you are using one. I use one every time I sharpen but I didn't always. SO keep it in mind please. That is all for now, I will shoot a video and continue along this line. I hope that at least one person out there will get something useful from my articles. Thanks for sharing! I usually try to get my stones flat with sandpaper over a thick glass. The coarser stones are kind of hard, though. The coarsest one I own is not perfectly flat and I wasn't able to flatten it even with the belt grinder. I kind of seldom use it, but whenever I need to I have to use just two inches on the edge of it. Good start. I will enjoy your views on stropping. Hi folks, I think If my water stone got dished to the point where I wasn't able to flatten it I would just not bother and use whatever I could of it. However I'm pretty obsessive about flattening and do it ever three knives at least. The sandpaper on thick glass works though for sure.